According to my long-suffering parents, I was born to be a writer. Whether I was assigning my Barbie dolls superpowers and tragic origins, writing ten-page tales when English teachers had only asked for three, or sending a high school bully’s note of insults back to them covered in red pen corrections, words and stories have always come naturally to me. Me outside the Brighton Pavilion in 2011. See, I did graduate. Honest! I was born twenty-six years ago in the lovely English seaside town of Worthing, West Sussex, a place I adore so much that I’ve never left — aside from when I got my degree. 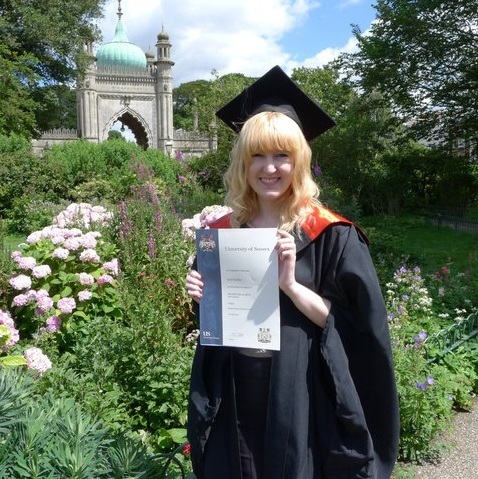 I studied at the University of Sussex from 2008-2012, gaining a BA (Hons) in English Literature and an MA in Creative and Critical Writing. I sharpened my skills in workshops and online, writing a long-running web story in my teen years based on — don’t laugh — The Sims 2. Now I’m much more grown up and focus my efforts on crime fiction for adults. My current project is a dark psychological thriller about a troubled young woman being held hostage in her own home while trying to escape her own demons. Panic Room meets Gone Girl, maybe?! I was thrilled to have my first ever piece of flash fiction, Homecoming Queen, shortlisted in August 2015 for the Mash Stories competition. And I was even more thrilled to be asked to join the judging team shortly afterwards! Although Mash Stories has now closed, it was a real privilege to get to read so many diverse stories every week for over a year, even if I did have to pass on some good ones. When I’m not querying agents, writing new novels and short stories, or judging other people’s work, I like to post writing advice for other aspiring novelists here on my blog. I’ve covered lots of key topics already, like how to show not tell, create unique character description, and avoid pesky filter words. I’ve also been venturing into more personal updates about my writing experience, with posts about rejection and social media anxiety. In terms of other hobbies, I love a wide spectrum of film and TV, like Hannibal, 24, Breaking Bad, Daredevil, Edge of Tomorrow, Mission:Impossible, Die Hard, Forrest Gump, Ace Ventura, Hot Fuzz, Star Trek – the old movies! — and almost anything action/sci-fi. I support Liverpool FC and manage a fantasy football team, and I’ve got my workout:pizza ratio in perfect balance. I like to think I’m a nice, friendly person — but I won’t lie, I’m not a .gif-sharing, caps lock-spamming, “me me me” personality type. If you want to be chipper and hyper all the time, good for you. Just don’t expect me to join in! Chilled-out introverted seriousness is more my style. Movies and football aside, my first passion is entertaining people with my writing. Helping others to do the same — whether in my writing group, through critiquing stories, or on this blog — is my second. 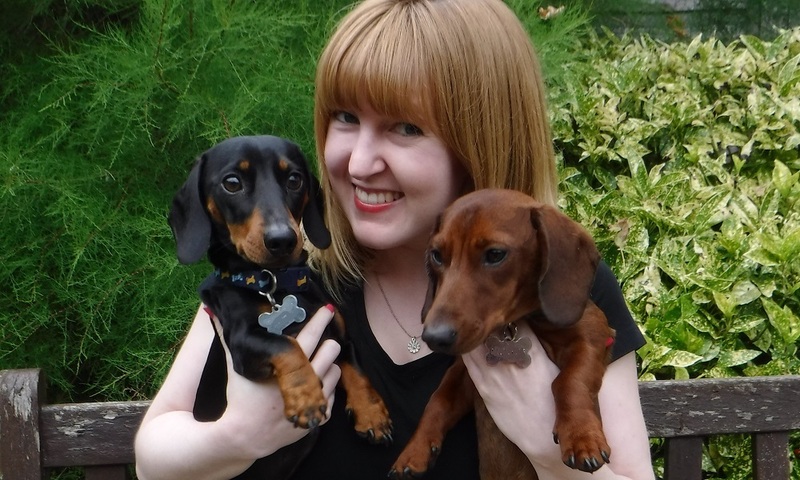 My third is spoiling my miniature dachshund nephews, Hans and Bruno, and kissing my cats, Libby and Rosie –- which is why they probably feature in almost every entry I post! But come on, those grumpy little faces are adorable.